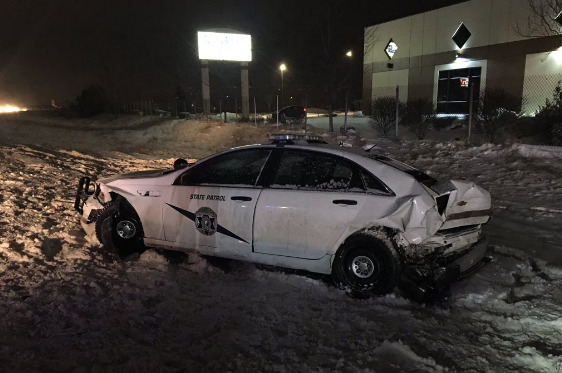 A Washington State Patrol trooper on scene of a crash on Interstate 90 in Spokane Valley was injured late Sunday when his car was struck by a passing vehicle, WSP reported. The trooper was transported to a hospital with injuries not considered life-threatening, WSP reported on social media. Troopers were responding to a crash about 6:15 p.m. on eastbound I-90 at the Barker exit when the car struck the WSP car. The driver was detained and is expected to be charged with vehicular assault, WSP said. Traffic was diverted from I-90 as the crash was investigated. Published: Feb. 10, 2019, 9:48 p.m.